SALISBURY, N.C. — The North Carolina Manufacturing Institute is continuing to grow and expand. With nearly 50 local manufacturers on board, the job opportunities for those interested are practically limitless. Graduates with little-to-no manufacturing experience are securing employment by transforming themselves into career-ready manufacturing professionals through this no-cost eight-week training program. 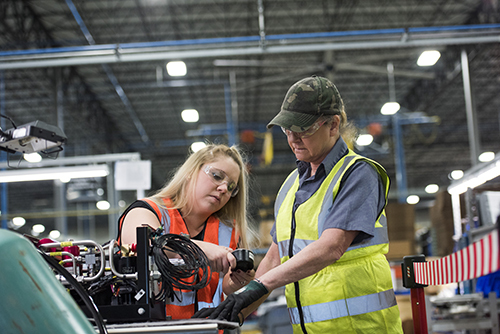 As part of the North Carolina Manufacturing Institute initiative, they gain knowledge and skills in safety, quality assurance, manufacturing processes and maintenance awareness. Those who have not considered manufacturing as a viable career option or those with no experience in the field should not be deterred from pursuing the program. There are well-paying jobs in manufacturing available right here in Rowan and Cabarrus counties. In fact, almost 90 percent of graduates find full-time employment within one month of graduating. The North Carolina Manufacturing Institute is a partnership conceived with leaders from Rowan and Cabarrus counties from both chambers of commerce, economic development authorities, the Centralina Workforce Development Board, Mitchell Community College and Rowan-Cabarrus Community College. The North Carolina Manufacturing Institute aims to build a clear and achievable pathway for people to acquire skills in order to access good manufacturing jobs in our local community, as it is specifically designed to link and leverage the existing assets of Rowan and Cabarrus counties to solve a growing gap between regional job seekers and available positions. The growth and popularity of these clean, high-tech jobs has led to a high demand for a qualified workforce. Selected participants enroll in the program for free, thanks to support from local manufacturers. They graduate with two national certifications – the Manufacturing Skill Standards Council’s Certified Production Technician and the Career Readiness Certification. Hiring managers from the North Carolina Manufacturing Institute partner companies are given the graduates’ resumes and are invited to the college campus to meet the graduates for a preliminary interview to kick-off their search for employment. Follow-up interviews and multiple employment offers are often a direct result of this event. The next eight-week training program begins soon. Morning and evening classes are available to accommodate various employment schedules and family obligations. All it takes to get started is a local phone call (1-866-418-9257), contacting Donna Ludwig (donna.ludwig@rccc.edu) or completing a NC Manufacturing Institute Interest Form on the NC Manufacturing Institute website (www.ncmanufacturinginstitute.com). Get details, including a list of those companies hiring the graduates, at www.ncmanufacturinginstitute.com. For more information about Rowan-Cabarrus Community College, please visit www.rccc.edu or call 704-216-RCCC (7222). The College is currently accepting applications for eight-week classes beginning in March, as well as summer and fall courses.